Last month, when I reviewed Titus's Offshore Warriors, I mentioned that Titus seems to have a great love of racing games. Now there can be no doubt that this is the case: Fire and Forget is yet another game in that genre—the third in a row, in fact. In Fire and Forget you've been chosen by the government to pilot a "Thunder Master"; a vehicle billed as the ultimate weapon. You must take your Thunder Master into enemy territory and blast away their tanks and gun emplacements, as well as dodge attacking helicopters. The road is filled with all manners of obstacles; some of which you should avoid at all costs and others that you need to acquire in order to keep your fuel tank brimming with Omega Kerosene. Rather than having a timer like most racing games, Fire and Forget uses your fuel tank to control the length of the game. The faster you drive, the sooner you'll find the Omega Kerosene canisters. Every time you're hit by the enemy, your vehicle slows to a crawl—and no matter how fast you're going, you consume the same amount of fuel. Once your tank is empty, the game is over. Also, each time your vehicle explodes, 10,000 points are deducted from your score. If your score goes to zero, the game ends. The graphics are reasonably nice, as are the sound effects. Unfortunately, game play is hampered by several peculiarities. Sometimes when your vehicle gets hit and explodes, you don't have time to get going before you are hit again. 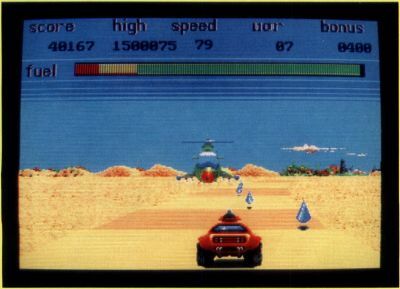 This is further complicated by the fact that if any of the street obstacles are near you when the vehicle reappears on the screen, it will explode once again. Many times, I've sat in front of the computer, gripping the joystick in frustration, while my Thunder Master repeatedly exploded, bringing me prematurely to the end of the game. Another problem is the animation. As is typical with many arcade-type games on the ST, when the action gets hot, the animation gets jerky. This causes the game to have a sluggish feel, but what is worse, it also means that the graphics can't keep up with the game play. In Fire and Forget you are frequently faced with a long line of obstacles that must be blasted out of your way. Unfortunately the fire button can't always keep up with the action on the screen. As a result you find yourself approaching an obstacle at high speed with a gun that doesn't always fire immediately when you press the trigger. Another problem with the game play is the way the random elements are handled. You know there's a design flaw somewhere when your scores vary from 30,000 to 1,500,000, from one game to the next. The problem seems to be the placement of the fuel cisterns: Sometimes they are placed everywhere, while other times you can't find one no matter how fast you make your vehicle go. The manual doesn't seem entirely accurate either. It mentions that of the two types of fuel cisterns, only the green ones will refuel your tanks. The blue ones are supposed to destroy your vehicle. Based on my experience, both the blue and green canisters will refuel the tank. And, I don't recall ever exploding when hitting a blue one. Titus has got a start on what could be a nice game here, but it is only a start and needs a lot of polishing. With some extra programming work, Fire and Forget could be a fun game. Without that extra work, you should deal with this game as its title suggests.